If it is June, it is firefly season in our neighborhood. Late spring is a tenuous time weather-wise with rains and dry spells and with temperatures at times bordering summertime and other times a bit too cold for spring. Fireflies like warm, humid and damp days. They only have approximately 21 days to live once they become fireflies after spending 2 years as larvae. Peak time, when you see the most number of fireflies is half-way through their life span and it is when we like to have our Neighborhood Firefly Walk in our park. Luckily for us, peak time this year ended up being on Father’s Day weekend and so we had our guided tour on Saturday June 17 and what a glorious time it was! We got lucky with a beautiful dark night with clear skies, no moonlight and comfortable temperature. The Fireflies were in abundance, blinking their hearts away. During our walk, we stopped at various points in our park to observe their lighting display, their light pattern and the color of their blinking light. 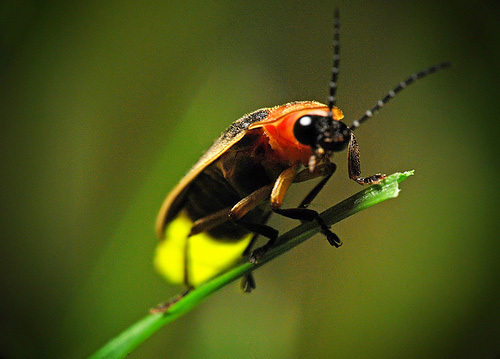 We also learned a few facts about them some of these are in our blog, Why I Love Fireflies. 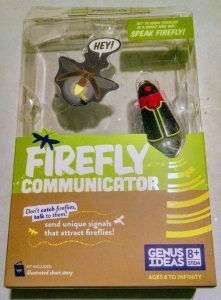 At the walk the neighborhood children had the opportunity to use the firefly communicator to attract several fireflies to them and they did! It was exciting to see. At the big pond area, we stopped and observed the night sky. We saw planets (Jupiter and Saturn), stars, constellations and satellites, in fact we saw four of them! We located the Hercules Constellation, the Big Dipper and learned how to find the North Star while being serenaded by the local frogs. All in all, I have to say the fireflies did put on a beautiful and mesmerizing flashing show, they did not disappoint. I am very glad we have such beautiful park in our neighborhood and such wonderful neighbors. If you are lucky enough to have them in your area, take some time to look and admire them. As for me, I look forward to see the next generation of fireflies next year!